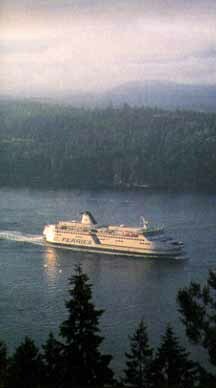 BC Ferries, technically the British Columbia Ferry Corporation, offers saltwater connections between points on the mainland and various islands. The freshwater ferries are under the jurisdiction of the Ministry of Transportation and Highways. The Passages Gift Shop allows passengers to "shop till you dock" and purchase such items as the SailPass, which is a single-price ticket entitling the bearer to four or seven consecutive days on up to 20 routes, along with gift certificates, casual wear, mementos and other products. For a 24-hour recorded message giving schedule information on Mainland/Vancouver Island routes call 604-277-0277 in Vancouver, 250-656-0757 in Victoria, or 250-753-6626 in Nanaimo. For schedule, general information and reservations (where applicable) call one of the numbers below, any day, between 7:00 am and 11:00 pm.